ST. PETERSBURG, Florida — The body of a former Galion woman was found in a storage shed Monday, and a man just released from prison a month ago has reportedly admitted to killing her. 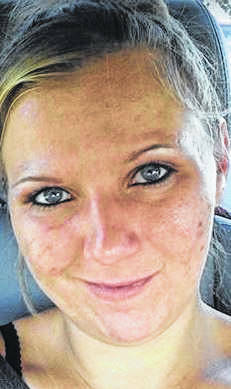 The body of Cheyenne Snyder, 29, who attended school in Galion, Crestline and in Shelby at Pioneer Career and Technology Center, was discovered by St. Petersburg police in a plastic storage tote in the back yard at 524 16th Ave. South, in St. Petersburg. Angelo Dante Beckford, 40, who lives in the house on 16th Ave. South, was arrested without incident by St. Petersburg police, reportedly returning to the residence after making an illegal drug purchase. According to a video news conference Monday, Snyder was the mother of two boys and grew up playing volleyball in Galion. She said Snyder’s family included two brothers and one sister. “She was well liked and loved in her hometown of Galion, Ohio,” said St. Petersburg Police Maj. Shannon Halstead, who also said Snyder’s family has been notified of her death. Halstead said Snyder,who had been living in Florida for about nine years, had a history of drug abuse, as did Beckrord, who had been released from prison April 1. Galion City Schools spokesman Chris Stone said a student named Cheyenne Snyder, with the same birth date (Jan. 13, 1989) as one provided in a news release, attended Pioneer Career and Technology Center as a Galion student from 2006 to 2007. He said she withdrew from Galion to attend Crestline schools in August 2007. During the news conference, Halstead said police think Snyder and Beckford had only known each other for about a week. Halstead says they got into an argument Sunday evening and Beckford shot her during the confrontation and later put her body in a storage container and moved her body to the shed. Halstead said police learned of the homicide thanks to some neighbors who said Beckford was acting strange and boasting about what a violent person he was. Beckford reportedly showed the tipsters Snyder’s body. Police, learning that Beckford was probably armed and dangerous, responded to the 524 16th Ave. South residents with a SWAT team. Beckford was charged with second-degree murder, aggravated assault, possession of crack cocaine, possession of drug paraphernalia and a probation violation.